I am frequently asked about blogging and how to use it effectively for marketing within social media. I decided to put together a list of my top ten tips that is specifically designed for the individual marketer or small to medium business. In no particular order, here are my top ten tips for using your blog effectively within your social media marketing strategy. I have broken them up into two sections – Strategy and Execution. 1) Write for your audience – Too often brands and marketers forget who their target audience is. Write for your target audience, not for traffic. Deliver value and relevance in your content, just like a proper content strategy within your social marketing strategy. Write content that solves their biggest problems, answers their questions and/or helps them improve. 2) Stay away from time sensitive writing – New is great and often shiny, but does it attract your target audience? Writing content about something new in your industry or an event that is happening can destroy the long-term validity of the content. It’s ok to include some time/event based posts, but try to write content that has value for your audience, that can be found via search and/or shared via your social media efforts over a long period of time – i.e. relevant, Legacy content. 3) Be concise – Remember that a blog post is NOT a magazine article. People have very short attention spans and keeping your blog posts short, to the point and without all the fluff is important. Give your readers clear points to absorb along with a title that states exactly what they can expect from your piece. 4) Have personality – Be real and approachable with your posts. Don’t be afraid to put your personality into your articles or even be a little controversial at times. 5) Write yourself – For MOST marketers or SMB’s doing your own writing is going to get the best results. Having the benefit of your voice consistently across your content is extremely helpful for your readers. For some that lack writing skills or the time and resources necessary to blog, outsourcing the function to a professional may be required. Be sure that the professional you select to write for your blog can follow your strategy and capture your voice (tone and personality) accurately. 6) Consistency – Just as with your regular social media marketing content posting, consistency with blog posts matters. You must have a consistent flow of relevant, valuable blog posts on your blog to build and retain an audience. Occasional posts will not be effective, so be consistent every week. I try to write two new blog posts per week. 7) Comments – Also like your social media marketing, responding to comments on your blog is important. Respond always and do it quickly after a comment is posted. 8) Use drafts – Whenever I think of a new blog post idea, I start a new posts in WordPress and save it as a draft. I add notes and bullet points for what I want to do with the post and save it. This way I always have some 30 blog posts started and only need to select one to finish whenever I need to write. 10 SEO – When writing a blog post, you want to not only follow the strategy items we have listed above, but you also want to consider the long-term search engine optimization of your posts. Including images, tags and keywords in your posts is highly important for being found on search engines. a) Always include a graphic that depicts the content. This is important when readers share the content on social networks, but also for SEO. Be sure the name the image file with words contained in the title and body of your post and also complete a description that does the same. b) Always include tags of the keywords and phrases appropriate for the post. c) Be sure the main keywords of your post are included in the title, the body of the post as well as in tags. 11) Be realistic – Be realistic about what you can really do. Don’t set editorial calendar expectations too high for yourself so that you can’t complete them. Don’t expect that you will get 20,000 hits a day when you are just starting out. Be consistent, even if that is only one or two blog posts per week. Commit to the realistic expectation and stick to it. a) When you post a new blog, share it multiple times that day in the social graph. 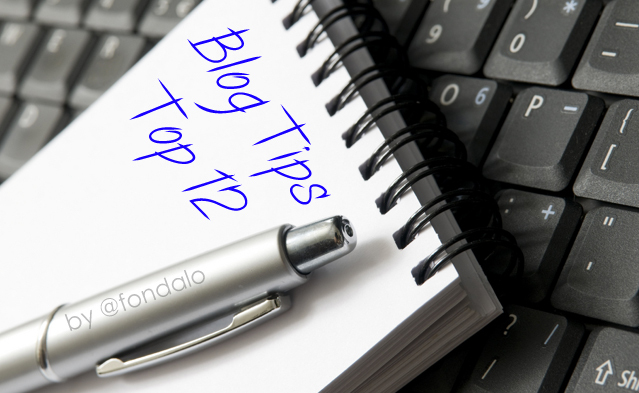 b) Keep a list of your blog posts and share them at lest once a week/month. A blog is an extension of your brand, your website, your overall web presence and more importantly your social media marketing. Understanding the best way to leverage and integrate it properly across all of them will help you begin see increased results. Thanks for the tip on naming the photo with relevant words, that was new for me. Great tips and very useful for a small solopreneur like me who will restart blogging soon. Cheers! Great post Robert! I agree with all of your points! One thing I would add for SEO for images is also add the keyword in ALT tags, not just the title. Search engines crawl these alt tags for keywords, and can greatly increase SEO :). Would you be so kind as to elaborate on that? (Hi!) What are ALT tags? Thanks! Alt tags are a section of adding a image to your blog in WordPress. Yes Daniel, great point! I tried to be thorough without making it too complex or difficult, but you are absolutely right! #9 and #11 are SO important! If you are in the mindset to just write, then write. Dont publish though! Schedule things out to give yourself some space for those days when you are not quite in that mindset. I could not survive without that Christina! This is really useful, thank you, have forwarded it on to others. The scheduling issue is the issue that chimes most with me. I tend to write posts for http://www.thesefantasticworlds.wordpress.com in the middle of the night, but I know my audience isn’t listening then, so a schedule for midweek, late afternoon (GMT time) is best, but I’m always watchful for a shift in audience timing. Really great points. Loved the one about saving blog starts or start of ideas in WordPress as a draft. So simple yet I haven’t done it and will help me for sure. Much appreciated! Great article, Robert. I think this is a great primer for those who are about to start blogging, and I will be sharing it through my own Social Media channels. Can I be so bold to add a ’13th Tip’? One thing I always advise my clients is that they should always really ask themselves whether their new blog entry is of genuine interest or genuine use to others. Too many blog entries are just filled out for the sake of maintaining a regular posting schedule and, although posting regularly *is* important, I think it is better to say nothing than to post something that does not enhance the lives of others or meets one’s own editorial standards. The above ties in with Tip 8. I always encourage others to keep a list of topics or blog ideas a month or so before embarking on a blog. If my client cannot come up with at least 6 different topics in that interim period, we re-evaluate whether a blog is really suitable for them and whether they can sustain one or not if it is. Great input Nick. Thanx for the additional tip 13 man. I couldn’t advocate no.4 any more #rhymingwin. It’s always so much more interesting to read a blog with personality. It gets me going to the end and encourages me to share it or reach out to that person. Great post. Really top advice here for a blogger that’s just starting out! Glad it was helpful for you Steve! Great tips Robert. As a professional copywriter, it’s amazing how easy it is to write in a clients’ voice and how hard it is to come back to your own. Your tips #4 and #5 hit home and are of course so crucial in today’s information-loaded age! And I love your #8 — great time saver! Great article. I’m in a internet marketing course at IADT and specifically added this blog based on it’s concise but thorough tips. The comments that have been posted are also great. It really shows how like minded (albeit geniuses) come together and disseminate the real facts of internet marketing, as opposed to “fluff”.